However, sometimes there is the requirement to go beyond the standard and integrate data from a custom or Third Party application. 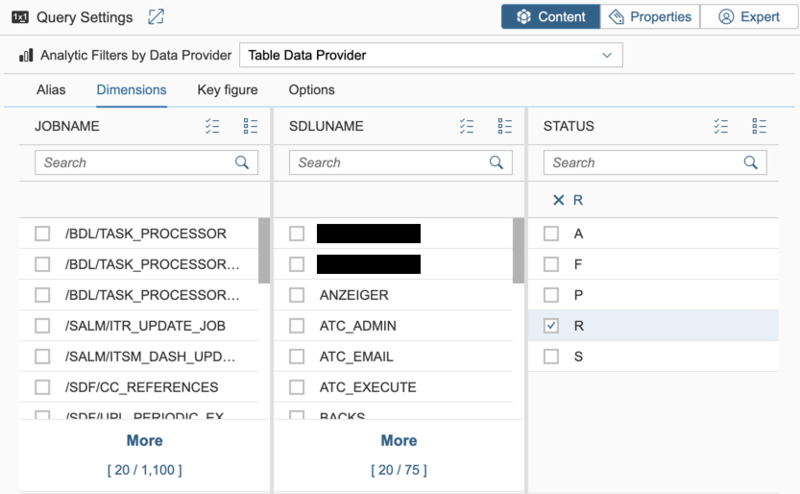 For those use cases, there is now a new data provider (/STDF/DP_TABLE) that let you read time series and data from a database table located on Solution Manager or on an ABAP managed system connected to Solution Manager. As we’ll see in the following, in order to get the most from the data, the table should be structured in a way that Focused Insights can distinguish easily between three kinds of information: Time, Dimensions and Key Figures. In the context of custom project, thus, we have to build the Z tables accordingly. The good news is that there are already several standard ABAP tables that we can read with the data provider /STDF/DP_TABLE. 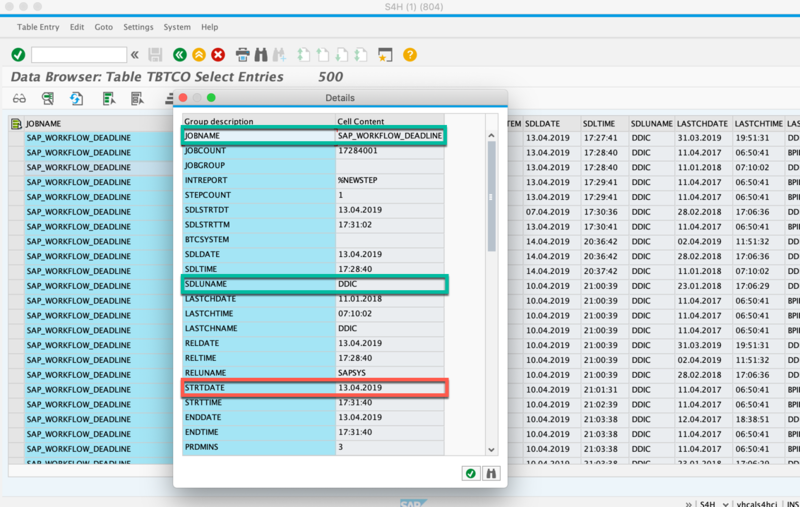 In this example, we’ll see how we can access the content of table TBTCO which contains the runtime information of ABAP Jobs. 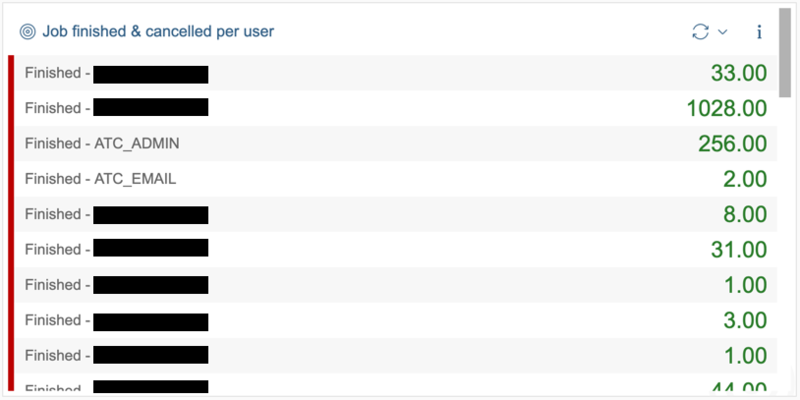 Key figure fields: we don’t use any key figure fields, we’ll just count the number of rows in the table. 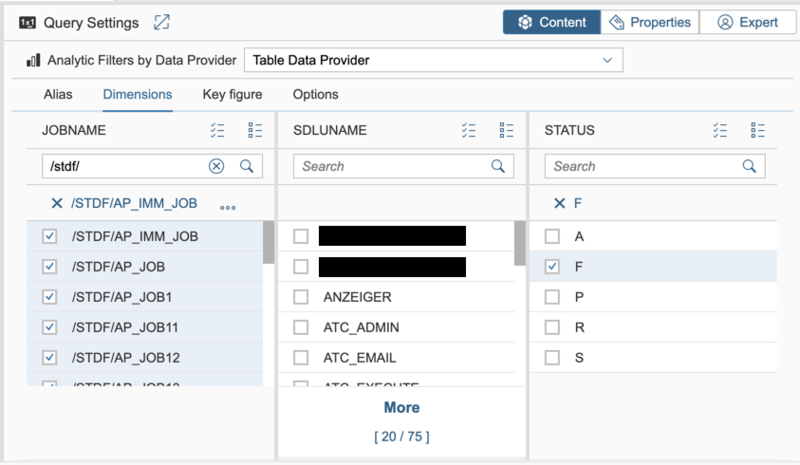 On the Focused Insights configuration table located on Solution Manager /STDF/DP_TAB_SRC, we create a new entry to configure the access to the table TBTCO. The alias “DEMO_JOB” is the key for this data source we’ll need later on. We let the field “RFC” empty, since we access locally the TBTCO table of Solution Manager . Field “TIMESTAMP FIELD” contains the table field used for the time dimension: “STRDATE”. Since the type of field “STRDATE” is DATS, the format configured in field “TIMESTAMP FORMAT” is “YYYYMMDD”. We are not interested in this example to go below the resolution DAY, while it could be possible if we use two fields instead of one (separated with a coma): “STRDATE,STRTIME”. In this case, the time format would be “YYYYMMDDHHSS”. See also table below for different time formats supported. 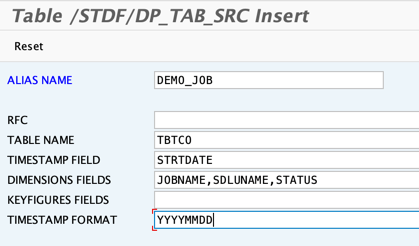 The field “DIMENSIONS” contains TBTCO fields “JOBNAME”, “SDLUNAME” and “STATUS” we’ll need to filter the data. The field “KEYFIGURES FIELDS” remains empty; we use the number of rows as the key figure. 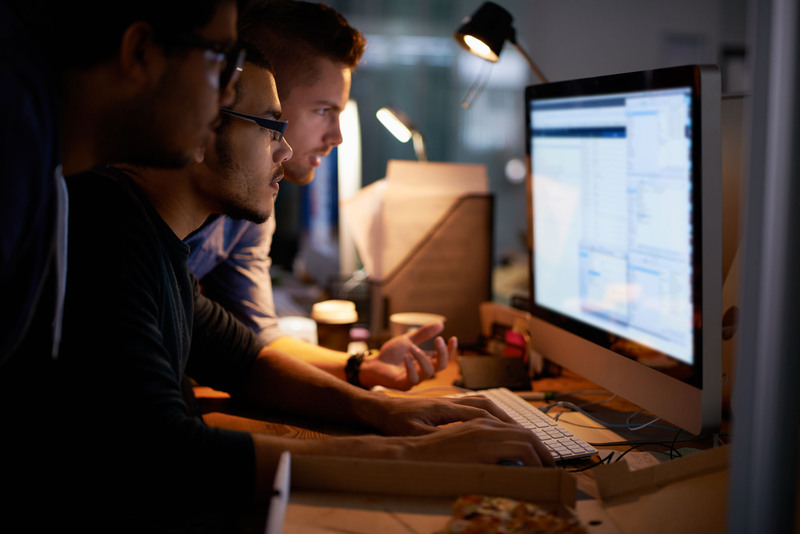 whether the table is accessed locally on Solution Manager or on a remote managed system through an RFC call, it is important to assign carefully the authorisations to the user who executes the request. The user must be granted the authorisation to execute the function module RFC_READ_TABLE together with the authorisations to access in display mode the source database table. Make sure to restrict the authorisations to the minimum required so that the user cannot access all database tables of the managed system. Once the data source is configured properly in table /STDF/DP_TAB_SRC, and user has the required authorisations, we can access it from OCC Dashboard. Make sure you are running Focused Insights SP2 or upper, with wave 4.3 or upper. This can be checked from the Focused Insights Launchpad, on the bottom right of the main page. In order to initialise the data provider /STDF/DP_TABLE make sure the setup has been ran successfully, especially the task “Init OCC” of “Step 7: Initialisation”. Create a new gadget “Current Running Jobs” with renderer “SLR_RENDERER”. Select data provider “Table Data Provider” (/STDF/DP_TABLE). Select the alias configured above: “DEMO_JOB”. On the section “Dimensions”, select the running job status: “R”. Remark: since filters values come from the source table (TBTCO), it could be that status “R” is not listed if no jobs are currently running on the system. In this case, you can switch to the expert mode and enter the status manually in the query string. We don’t need to select a key figure. Go to the section “Options”. Select “JOBNAME” as drill down dimension. 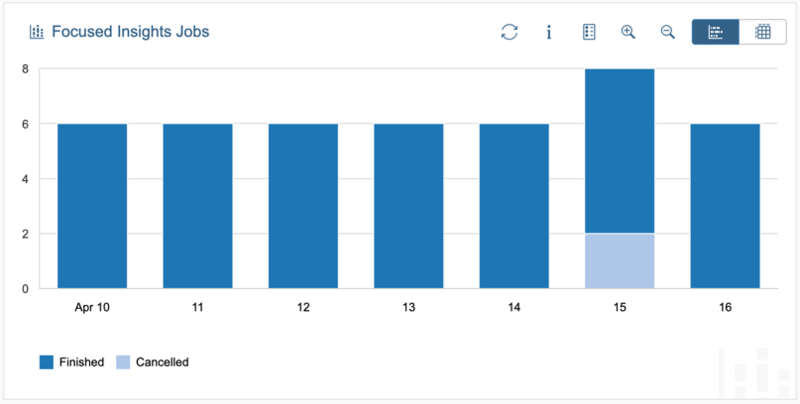 Select “Count” for the aggregation. Select the time frame “Today/Day”. You can now save and display the result: all the running jobs on the system are listed in a table. Since we use a current time frame (Today/Day), the cache is not involved and the table is updated with the real time information each time you refresh the gadget. Create a new gadget “Job finished & cancelled per user” with renderer “SLR_RENDERER”. Select time frame Today / Day. Create a new query with legend “Finished”. On the section “Dimensions”, select the finished job status: “F”. Select “SDLUNAME” as drill down dimension. Create another query with legend “Cancelled”, use the same configuration and filters, but this time select the aborted job status (“A”) instead of the finished job status. You can now save and display the result: all the finished and cancelled jobs per user are listed in a table. Since we use a current time frame (Today/Day), the cache is not involved and the table is updated with the real time information each time you refresh the gadget. Create a new gadget “Focused Insights Jobs” with renderer “STACK_COLUMN_CHART”. Select time frame Last 7 Day / Day. With the help of the filter, select all job names starting with “/STDF/”. You can now save and display the result: all Focused Insights jobs finished and cancelled during the past 7 days. Focused solutions for SAP Solution Manager, is the extension concept for SAP Solution Manager, with the idea of helping our customers meet their particular innovation needs on an individual basis, without the need for homegrown software.